When thousands of indigenous farm workers went on strike in the San Quintin Valley of Baja California onMarch 16, their voices were not just heard in the streets of the farm towns along this peninsula in northern Mexico. Two years earlier, migrants from the same region of Oaxaca struck one of the largest berry growers in the Pacific Northwest, Sakuma Farms, and organized an independent union for agricultural laborers, Familias Unidas por la Justicia (Families United for Justice). Indigenous Oaxacan migrants have been coming to California for at least three decades, and the echoes of San Quintin were heard as well in towns like Greenfield, where worker frustration has been building over economic exploitation in the fields and discrimination in the local community. “We are the working people,” declared Fidel Sanchez, leader of the Alianza de Organizaciones Nacionales, Estatales y Municipales para Justicia Social (the Alliance of National, State and Municipal Organizations for Social Justice). “We are the ones who pay for the government of this state and country with the labor of our hands.” This was not an excess of rhetoric. In just the first two weeks of striking at the height of the strawberry season in April, Baja California’s conservative Governor Francisco Vega de Lamadrid estimated grower losses at over forty million dollars. Agribusiness farming started in San Quintin in the 1970s, as it did in many areas of northern Mexico, to supply the U.S. market with winter tomatoes and strawberries. Baja California had few inhabitants then, so growers brought workers from southern Mexico, especially indigenous Mixtec and Triqui families from Oaxaca. Today an estimated 70,000 indigenous migrant workers live in labor camps notorious for their bad conditions. 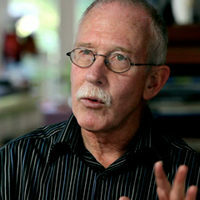 Many of the conditions are violations of Mexican law. 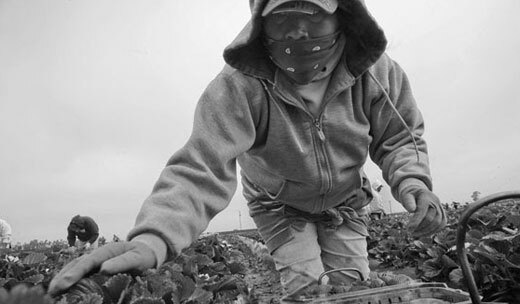 Once indigenous workers had been brought to the border, they began to cross it to work in fields in the U.S. Today the bulk of the farm labor workforce in California’s strawberry fields comes from the same migrant stream that is on strike in Baja California. So does the migrant labor force picking berries in Washington State, where workers went on strike two years ago. Two of the 500 strikers at Sakuma Farms were teenagers Marcelina Hilario from San Martin Itunyoso and Teofila Raymundo from Santa Cruz Yucayani. Both started working in the fields with their parents, and today, like many young people in indigenous migrant families, they speak English and Spanish – the languages of school and the culture around them. But Raymundo also speaks her native Triqui and is learning Mixteco, while Hilario speaks Mixteco, is studying French, and thinking about German. Rosario Ventura was another Sakuma Farms striker. She lives in California, and comes to Washington with husband Isidro, for the picking season. Ventura is from a Triqui town, while her husband Isidro is from the Mixteca region of Oaxaca. They met and married while working at Sakuma Farms, something that might never have taken place if they’d stayed in Mexico. The big agribusiness corporations that market the strawberries, blueberries and blackberries sold in the U.S. dispute such charges. Sakuma Farms says it guarantees its workers $10/hour with a piecerate bonus, and workers have to meet a production quota. But these companies should start paying attention to these voices. They are not only coming from their own workers, who produce their profits, but they express a building anger and frustration at the continued poverty among Oaxaca’s indigenous migrants. Maybe the growers should learn Triqui and Mixteco, so they can hear what’s being said.